This report was first published in 2011. Due to numerous requests, we are republishing the story. The time is right because the Giraud Annealer is currently on display on vendors’ row at Camp Perry. Doug Giraud will be at Perry through the morning of August 4th. 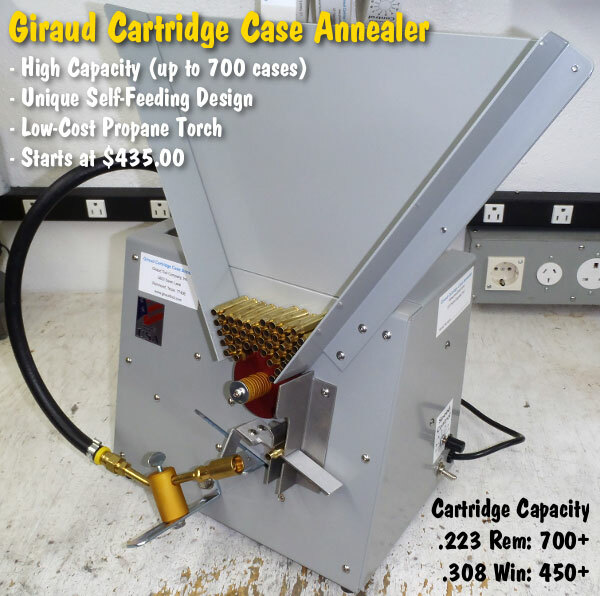 The Giraud annealer uses a large, V-shaped hopper to hold up to 700 .223 Rem cases or 450 .308 Win cases for annealing. 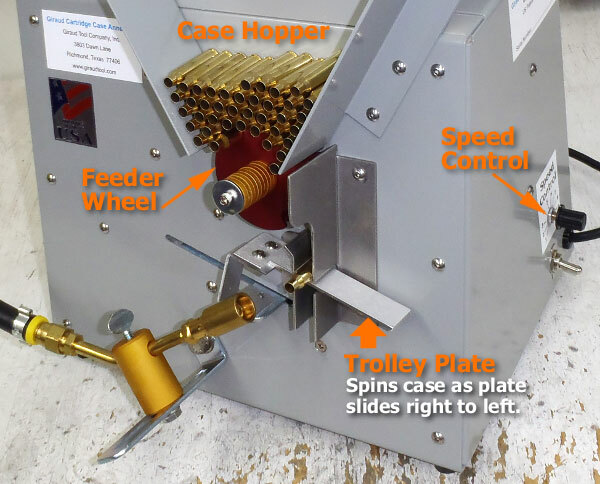 You can switch from small cases to larger cases by swapping out the rotary Feeder Wheel below the hopper. Changing Feeder Wheels takes a couple minutes. Five available Feeder Wheels (with different size cartridge slots) let you anneal pretty much any size cartridge — from .17 Remington all the way up to .50 BMG. The common .223 Rem and .308-sized cases used by High Power shooters are served by the Red Feeder Wheel and Blue Feeder Wheel respectively. The Blue Wheel will also work with 6mmBR, .243 Win, and .30-06 cases. The three other Feeder Wheels are: Black (.300 Win Mag); Purple (WSM, RUM, RSAUM, Lapua and Norma Mags); and Green (.50 BMG). For the large mags you also need to switch to a wider Trolley Plate. Yes the case spins in the flame — the Trolley Plate running under the case rotates it. The user may wish to experiment with the speed control knob on the right side panel near the power switch. Typical annealing operations will require the cartridge cases to be positioned in the torch flame for between 6 and 9 seconds. Doug has components for 100 more machines, and he’s producing them at a rate of 15 units per week. He’s been back-ordered, but if you order soon, Doug believes he can ship the Annealing machines in about six weeks from date of order. The basic price, with one Feeder Wheel and one Trolley Plate, is $435.00. Additional Feeder Wheels cost $20.00 while extra Trolley Plates are $10.00. For more information, visit GiraudTool.com. To place orders, call (281) 238-0844 Monday through Friday between 9am and 5pm CST. You can also email doug [at] giraudtool.com. Share the post "Innovative Vertical-Feed Annealing Machine from Giraud Tool"
After 65 years in the same Merriam, Kansas location, Hodgdon Powder Company, Inc., a leading provider of smokeless and muzzleloading powders, has moved into new corporate headquarters on Vista Drive in Shawnee, Kansas. In 1947 Company founder Bruce Hodgdon originally established his powder business in Merriam, Kansas. This same location had served as the company headquarters for the past six and a half decades. 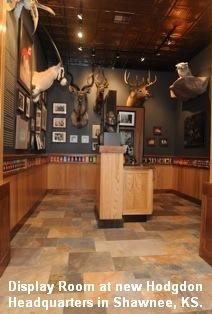 However, Hodgdon’s operations have outgrown the original facility. So, a new, larger facility has been established just eight miles from the old location. The new Corporate Headquarters in Shawnee, KS offers a museum, first class reloading training facilities, conference rooms, guest lobby, and modern office space for staff. READ History of Hodgdon Powder Company. Commenting on the move, CEO Tom Shepherd said, “This is a new era and exciting time for Hodgdon, after months of preparation we are delighted to have secured this facility for future growth opportunities.” To find out more about Hodgdon visit hodgdon.com, write to 6430 Vista Drive, Shawnee, KS 66218 or call 913-362-9455. Share the post "Hodgdon Opens New Corporate Headquarters in Shawnee, Kansas"